Lenovo’s CEO may have inadvertently shown off the successor to Motorola’s smartwatch, the Moto 360. Yang Yuanqing posted in image to social network, Weibo, showing off a briefcase of Motorola smartwatches, although the units differed from the Moto 360 we all currently know. The aim was to show off the good looks of the Moto 360, although the units in the image turned out to be slightly different to the currently available smartwatch. For those who don’t know, Lenovo bought Motorola from Google last year for just over $2.9 billion. The main different in the image appears to be that the timepieces carry lugs on the side of the frame in order to attach wrist bands. The current Moto 360 on the other hand, had no lugs, with the wrist band attaching from under the device. The addition of lugs makes the Moto 360 look just a bit more watch-like, there are also varying colors, including black, gold, dark grey, silver and champagne. 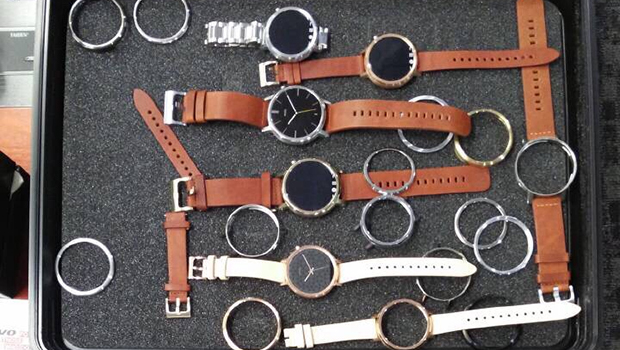 These could just be test units from the original production of the Moto 360 but it could also be our first look at an updated model. KitGuru Says: Honestly, the differences between the watches in the picture and the one that is currently available are minimal. If Motorola were to launch an updated Moto 360 this year, it would probably mostly consist of design changes, rather than significant hardware improvements.